Poor workmanship and materials are to blame for fracking-related contamination of water supplies, new research has shown. 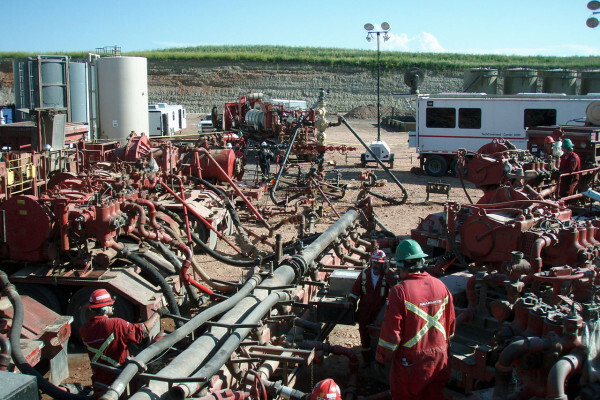 Fracking, or hydraulic fracturing, is a way to recover natural gas from deposits deep underground. Fluids at very high pressures are pumped down a borehole into gas-rich rocks below. The force of the fluid fractures the rock releasing pockets of gas which are tapped off. Up to one third of the USA's natural gas supplies are now recovered via this route. But many are concerned about the environmental impact of the process, with some people even claiming to be able to set fire to their drinking water, which is becoming contaminated with escaping methane. Now a new study from scientists in America has shown that it's not the fracking process per-se that's allowing the gas to escape but instead poor worksmanship and poor materials used in the boreholes. By analysing the composition of gases emerging from wells and comparing this chemical fingerprint with traces of gases dissolved in contaminated water supplies, it's possible to trace whether the gases entered the water as a result of the hydraulic fracturing process itself deep underground, or have leaked out through the pipework that brings the gas to the surface. Previously scientists have attempted to do this using only the relative proportions of the fracked gases themselves - like methane, ethane and other hydrocarbons - to produce a gas fingerprint. However, temperature, ground chemistry and microorganisms can all affect the relative gas proportions, making the measurements unreliable. The key to the new work, which has been published in PNAS by Duke University scientist Thomas Darrah and his colleagues, is the inclusion of the chemical fingerprint of noble gases like argon, neon and helium, which are also present in trace amounts underground. And as these gases aren't altered by microbes and do change in highly predictable ways as they come up through the ground, they can give a much more precise indication of the journey that gases have followed to reach the surface. Using this approach on over 100 groundwater wells in Pennsylvania and Texas, the Duke team have found that the source of the gas contaminated water isn't the fracking process itself but instead leaky pipes on the way up.